Can two hearts come together in one divided town? After Nash left, Tally managed to struggle through her own losses without him. But now that she’s crossed paths with him again—at Cottonbloom College, where the grown-up, gorgeous Nash teaches history—she is reminded of their cherished youthful connection…and an attraction that has only gotten stronger with age. Between Tally’s possessive ex and Nash’s snobbish aunt, no one thinks they belong together. In a town torn apart by old resentments and rivalries, can they find their way back to the life they once shared—and turn their long-lost dreams into a real and lasting love? THEN HE KISSED ME is a great addition to the Cottonbloom series, sweet and beautiful, filled with heart-tugging emotion and is the perfect best friends to lovers’ story. The connection between Nash and Tally was so strong that it survived two decades of separation and when they reunited, it felt like they had never been apart. 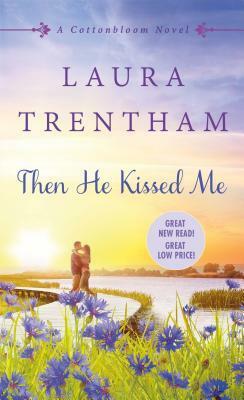 Ms. Trentham paints such a compelling picture of their childhood that a vision of a young Tally and Nash sneaking off to spend time together made me sigh with pleasure. Nash is such a heartthrob, smart, caring and really sweet. His appeal lies in his geekiness and the fact that he is so unassuming and unaware of how attractive he is. Even though he has lingering insecurities from his youth, he doesn’t let them overwhelm him like Tally does. She could be the poster child for self-sabotage because every time things were going well in her life and between them, she found a way to derail them. In fact it was so constant, it became annoying. In spite of that, Tally was really easy to understand because all she really wanted was someone to accept her and love her. I have to say that I had a smile on my face most of the time I was reading this book because their conversations were so much fun and while Nash was laid back and easygoing, he had some latent alpha male tendencies that came out at just the right moments and he really knew how to handle Tally. There are similarities between this story and the previous one, but each character is unique enough that it does not take away from the stories, but rather enhances them. The appeal in this book lies in the simplicity of the story and the small town lifestyle, and the ongoing feud between Sawyer and Regan as well as the drama surrounding the coming festival are enough to stoke my interest in the next installment of the series.